Renewing one’s faith in people, for some, is no easy feat. Sometimes it takes something big — or, as one South County father recently discovered, something big, and slow, and green — and lost — but deeply treasured by his 11-year-old son, and a stranger’s kindness. Marshall Flatt, 53, and his son, Travis Flatt, are the proud owners of a 60-pound pet sulcata tortoise. His name is Samson, a biblical name symbolic of strength, Travis said. in the world, has a life expectancy of up to 150 years. However, that life span might have been drastically shortened after a gate to the family’s home in Chateau Woods was mistakenly left open on Oct. 14, a regretful Travis explained. The tortoise appeared to have wandered away overnight — albeit, slowly. It was a cool night, with a low of 50, and without returning to the warmth of his enclosure’s heat lamps, Marshall wasn’t optimistic. Moreover, he wasn’t optimistic about people who may have seen Samson, he said. “I really figured someone found him and picked him up. As soon as they laid eyes, trucks would stop, he’d be in a truck and he’d be gone,” Marshall said. Incidentally, Marshall was mostly right. On Oct. 15, a man in a truck, on his way home from work, found Samson in the middle of the road. The man, Chris Marino, a resident of White Oak Estates, an adjacent neighborhood to Chateau Woods, picked up the tortoise, placed him in the bed of his truck and brought him to his home, placing him in the backyard. His intention was simply to keep the animal safe while trying to find its owner, he said — only later did he learn that he had found Samson a stone’s throw from the tortoise’s home. 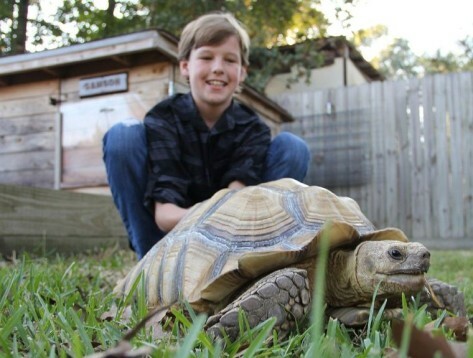 via Lost 60-pound pet tortoise returned to 11-year-old owner – Your Houston News: The Woodlands Villager: News.